Periodontists are dentists who have taken further study in order to specialise in the field of periodontics. Periodontics is concerned with the diagnosis and treatment of gum disease known as periodontitis. Periodontists are also concerned with the implementation and maintenance of dental implants to replace missing teeth. Periodontitis is a serious oral disease, which if left untreated, can lead to loss of teeth. The disease is caused by a build up of bacterial plaque and can cause bleeding and receding gums and loose teeth. Millions of people are thought to have some form of periodontitis and are unaware that they actually have the disease. There are many forms of the disease including chronic and aggressive periodontitis and gingivitis. If the disease is caught early enough, periodontists will be able to use non-surgical methods, such as root-planing and dental scaling to remove the plaque. If the disease has been left untreated then the only option may be surgical procedures including bone grafting, crown lengthening and tooth and gum contouring. Periodontitis is a recurring disease and will come back if preventative measures are not followed. If you are suffering from any of the above symptoms then it is important to visit your dentist as soon as possible. He will assess the situation and if needed he will refer you to a periodontist. 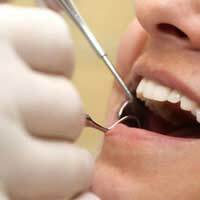 The periodontist will give a complete oral and periodontal exam including x-rays in order to check for possible loss of bone. Research has shown that the disease can be passed from person to person through saliva. If a family member has periodontitis then other members of the family are at risk of contracting the disease. Pregnant women who have the disease are also more likely to give birth to babies too early and too small. The disease has also been linked to other health conditions such as diabetes, heart conditions and respiratory problems. The bacteria that causes periodontitis can travel through the blood stream and infect other parts of the body. Periodontists will also perform a procedure for missing teeth using dental implants. These are an alternative to dentures and bridges that consist of fusing replacement teeth to the jawbone. Dental implants are a popular alternative to the traditional replacement methods as they are non-removable and are indistinguishable from real teeth. However, dental implants are not suitable for people who have had major bone loss beneath the gums as the implants need strong support to stay in place. As with all dental and oral problems, prevention is the best cure. Periodontists do not differ from dentists in the advice they give their patients on preventative measures; a good daily dental regime is needed to keep plaque at bay. Regular daily brushing and flossing, combined with bi-annual visits to the dentist are the best way to avoid periodontal infection.